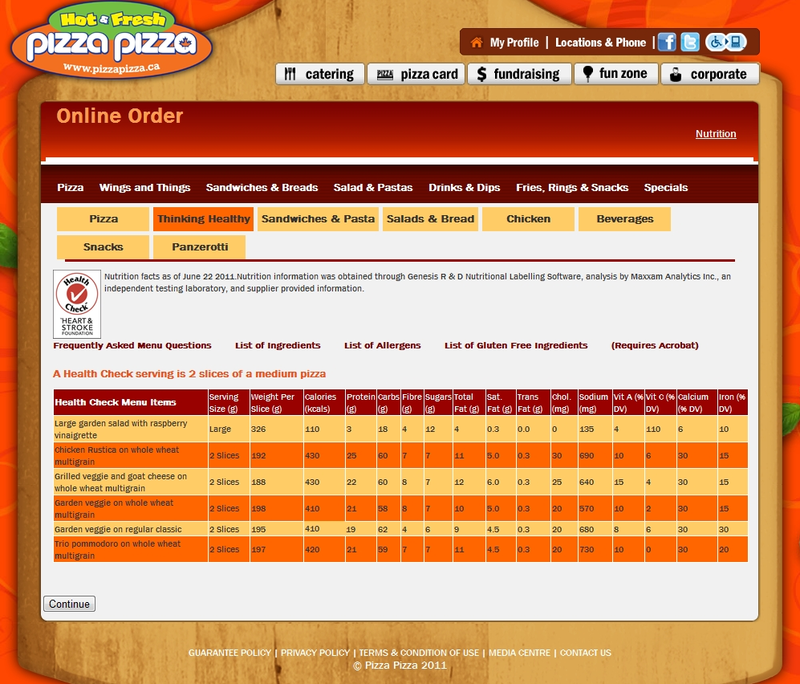 Weighty Matters: The Heart and Stroke Foundation Thinks Ordering in Pizza is Healthy? The Heart and Stroke Foundation Thinks Ordering in Pizza is Healthy? "lead in eliminating heart disease and stroke and reducing their impact through: The advancement of research and its application; the promotion of healthy living and advocacy"
has just given it's Health Check seal of approval to pizzas over at PizzaPizza, a national Canadian fast food pizza chain. In so doing the Heart and Stroke Foundation is continuing its mission to further normalize restaurant meals and also continuing to ignore research that shows Health Halo'ing at restaurants leads to increased consumption, and that simply having Health Check'ed items on the menu, might lead to people ordering less healthy choices due to "vicarious goal fulfillment". The fact remains, responsible health organizations should be encouraging people to eat out less frequently. Given people are likely to eat more than a Health Check approved serving (2 slices from a medium, but you can't just order the 2 slices, you've got to order the whole medium), that they may well order sugared sodas or appetizers, that less health aware family members may not like the Health Check'ed options, that they'll be forgoing the opportunity to cook a more healthful meal at home, all the Heart and Stroke Foundation is doing with its abhorrent restaurant program is discourage home cooking and put a veil of health on an incredibly unhealthy behaviour. How many slices of a medium pizza do you generally eat at a sitting, and do you think encouraging and enabling meals out is a good plan? Way to promote "healthy living" and "apply research".